Jinx and the guitar case - an unusual bed! I believe Jinx is an applehead Siamese. I have had him for four years now and have no idea how old he is. I found him as a stray, and though he was de-clawed and neutered no one claimed him, and so he became mine. He is really dark and I would consider him to be an older cat. He is extremely vocal. He was 18 lbs in the beginning and now he's down to 12 lbs, I try to maintain his weight because he will eat any and everything ... even the dog's food, cornbread and Cheerios. He acts almost like a dog! Thank you Kristen for your photo and story of Jinx - he's a gorgeous boy. I agree that in type he's an applehead, as he has the rounded face and stockier body shape of the applehead. In color he's like my Bandit, a very dark seal point - and seal points do have a tendency to get darker as they get older. 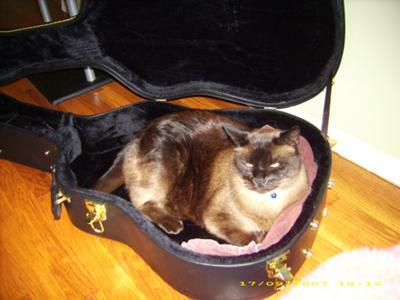 I love his bed in the guitar case - he looks so comfy there it could almost have been made to fit him! Comments for Jinx. An Applehead Siamese? So, one February morning I went out to breathe the cold winter air and I saw this cat. He came onto the back porch to drink from an empty sandbox filled with rainwater. He let me pet him so I gave him some cold cuts and tuna. It's November now and he lives inside the house. We said "Com'ere, cat" when we would feed him, and he thinks his name is Cat. Cat pretty much fits your description, but he is more dark than most Siamese cats. He is very vocal, has pretty pale blue eyes, and can't see well. A few reasons we took him in is cause he is declawed and his teeth are blunted. Cat only bites when the person really deserves it, but it still doesn't hurt much. I love cats, especially this one. I've had cats around me all my life, pretty much. Anyway, He's a sweetheart! We adopted a baby Seal Point five years ago. We raised him as both an indoor and outdoor cat. He was without a doubt the prettiest cat we have ever seen. Just like a parent, right? What amazed us the most was how smart he was. I swear he could understand English. He made us laugh everyday with his antics. We let our daughter keep him while we went on vacation. During our absence he ran away. He has been gone now for about four months. Our daughter lives in the country and I am sure he lost his life to bobcat that lived in the area. We had no idea you could fall in love with one of these cats as much as we did. Think about him every day and see him in my mind laying on the couch, flat on his back, with all four legs straight up in the air, sound asleep. He was born in the shop of a car lot, so we called him Hotrod. I will think about him and miss him everyday for the rest of my life. Note from Caroline: Steven, I'm so sorry for your loss. Our cats do become like family, and Siamese in particular have that ability to understand and 'talk' to us, they're amazing. Hotrod is such a great name! I hope one day you'll think about getting another Siamese cat. But yes, in areas with predatory wildlife it's a good idea to either keep your cats indoors or provide them with an outdoor screened area where they can be kept safe. I'm very new at "Siamese" behavior but I did notice that the cat eats like a dog! I'm glad you are aware of it and keep an eye on its weight. I realized quickly that I must do the same with Jazz. He will eat and eat until he's ready to explode and will try to sneak into the dog food too if I let him. Jinx is a beautiful Seal Point. His fur looks so shiny, you must take good care of him. Originally, the term 'Applehead' was a derogatory term given to the Old-Style Siamese by the Modern Siamese breeders. It was eventually adopted by lovers of the Old-Style Siamese as a kind of nickname. Beautiful cat, that Jinx. Yes he looks like he could be an Applehead Siamese. Definitely looks like he could be one of the family. Return to Types of Siamese Cats.